I could tell you to double your traffic to double your income. That would be a lazy answer to this challenge, wouldn’t it? Sure, if you double your traffic and your ecommerce conversion rate held true, you could double your donations. But doubling your traffic is difficult. It takes a lot of money and effort to increase incoming traffic and the ways you could achieve it in a short period of time likely won’t have the same conversion rate as your existing traffic. No, I’m not going to tell you to double your incoming traffic to double your donation revenue. Let’s talk for a second about your donation funnel. This is the step by step process someone takes to become a donor. There are often multiple types of funnels: for example, you might get a donor at an event. Or perhaps a donor will come through a church partner. 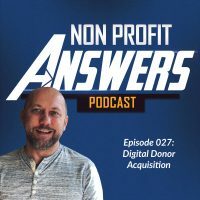 In this case, we’re going to talk about how to acquire a new donor in the digital space using an email acquisition tool. When we look at the funnel, we look at it backwards. We start with the end in mind – the donation. Let’s map out what a typical digital donor funnel will look like for a donation coming from email. Let’s start at the end: the donation. How do they donate? They do so on a landing page you’ve setup for your campaign. So, how do we get someone to donate from email? Well, they’re going to need to click a link to a donation page. So now we have our last two steps in the funnel – someone clicks a link in an email to the landing page and then converts into a donor. Now, let’s take it one step backwards. How do they click a link in your email? They have to open the email. So we have another step – the donor opens the email to click the link to the landing page to make a donation. To receive the email, they need to be an email subscriber, so there is a step for them to signup for your email list. The most effective way we’ve found to accomplish this is to offer some sort of incentive: an ebook, a video, or other free download in exchange for their email address. So you see, once they are on your email list, open your email, click a link to a landing page, they can give. The first step in the funnel is they have to visit our site in order to signup for our email list. This may be organic traffic or paid traffic; either way, there is a visit to your site to kick off the funnel to make a donation. This could be an addition onto this funnel or a separate funnel for how you drive people to convert into email subscribers. Let’s explore how we can use this funnel to double your income. Let’s focus on doubling one conversion rate. Nonprofit fundraising can be challenging, but by focusing on one metric and trying to double it, and then moving on to other metrics and doubling them, you’ll experience high growth at your nonprofit. Not all of your conversion rates, let’s focus on one specific conversion rate. Let’s focus on doubling your email opt-ins. Let’s look at this scenario and imagine that we have the same volume of people visiting your nonprofit website, but we work to improve on some things. Let’s say we move from a newsletter offer to some sort of premium that is related to your mission. Let’s imagine in this scenario that we double the opt-in to our email list. 40% isn’t unheard of with the right offer to match your audience. So what will happen if you double your email opt-in conversion rate? You grow your email list much faster. You get more people to open your email appeals. Therefore, more people click to your donation page and you double the number of donations you receive. Let’s imagine a different scenario where you have the same number of people opting into receiving your emails yet you improve your email appeal and more people click to your donation page. In this case, with double the number clicking through to your landing page, you convert double the number of donors. Perhaps instead you improve your conversion landing page to convert more people to donors but testing new headlines, copy, or aesthetic elements like the color of the buttons. Testing, tweaking, and improving these elements will help you improve your on-page conversions and donor experience. When we focus on improving the conversion rates of different steps in the funnel, we can see big results without having to throw more money at driving people into the funnel.